Think in the right direction -- economists fill the air with jargon. Let's not do that. What effect does our own background have on how we view other economies? What is "property" and who, if anyone has a right to own it? to control it? to dispose of it? Does economic liberalism require abolition of property? Will equitable distribution do? What is the function of "power" in acquisition and holding of property? How is property inherited? "Gavelkind" and primogeniture? Can groups, or "peoples", or "nations", or "tribes", etc., inherit? What are "takings", eminent domain, adverse possession, and is there ever really a "greater good for the greater number"? Are we the first to think about such things? What survived into medieval times? Did medieval times produce anything new? What is manorialism? Feudalism? Latifundia? Any further questions that need answering? 1. Rural Economy Early medieval Italy was an overwhelmingly agrarian society. Tenants rather than slaves worked farms. A few skilled specialist slaves still remained. Rent was paid in cash or kind to the curtes (estate center à "court") of the landlords. The "fall of the Roman Empire" put many people back on the land. As food/water distribution systems collapsed, folks just had to be closer to food sources. Rents in kind reflected what the peasants could grow for their own use: grains (rye, north; wheat center and south), grapes after the 8th century, olive oil in the center and south (Spanish imports having greatly declined due to loss of control of sea routes), hunting and gathering in the forests (much more extensive than now). Meat was fairly common on farmers' tables in the earlier period (mutton, beef, pork raised individually) but less common as specialist herders took over raising meat for the market -- but as meat consumption went down among farmers, more was sold to increasing urban populations. Animal "byproducts" -- leather, wool, tallow, glues became more available and industries using them rose in towns. Fruits and vegetables were first grown for individual use and later for markets. Early land ownership: many tenants, some peasant owners. Acreages were small -- even big landowners owned hundreds or even thousands of small plots rather than one big farm. Big landowners often had their seats in cities and had local overseers -- often individual tenants or hired peasants. Northern estates gradually became more organized -- there, unpaid labor on the demesne (land farmed by the owner rather than by the tenants) might also be required. Estates could be huge and could produce salable surpluses. Over time, estates were consolidated and larger landholdings became more common. The papacy eventually was the main "Roman" landholder -- in quotes because papal estates, the result of donations (including the donation of Pepin) were far-flung, not just around Rome: papal estates in the far south were huge. Eventually, after French "donations", papal lands included tracts in present day southern France -- the Avignon papacy was on pre-existing papa property. By the 12th century the papal estates were among the largest in Italy. [This did not imply that the popes were among the richest -- many of the great families had other sources of income, especially trade, which the popes never had. Eventually, when the Popes were drawn from the great families -- starting in the late Medieval, when there were, for example, Orsini and Colonna popes -- papal and family fortunes became indistinguishable. Contrary to modern popular opinion, popes or papal families didn't increase their wealth by attaining the papacy. It was usually the other way around. Having a pope in the family was prestigious but costly.] Money rents became more common as time went on, because there was a fair amount of cash floating around in trade and because new lands brought into cultivation "around the edges" gave tenants produce to sell for cash. As time went on, the "aristocracy" consolidated their power, but note that you had to have some power (= wealth of some kind, gotten by whatever means) to become an aristocrat. The aristocracy was actually just a loose assemblage of the rich and powerful -- plutocrats. Kings developed the same way. The very existence of a "Feudal System" is questionable -- not because it wasn't "Feudal" but because there was no real "system" except as seen ex post facto. In Italy, more than in the rest of Europe, there developed a "landed plutocracy" -- rich landowners who gradually consolidated large estates which were often run from urban offices by bureaucrats employed by the rich. Such "agribusiness" wasn't new, nor did it end with the medieval period. When other investment opportunities were available they put some money into that also, but the Italian economy was predominantly agricultural at least until the end of the 19th century. As the aristocracy developed, peasants lost out -- land and sometimes even their freedom was lost. Kings (there were usually several regional "monarchs" often with "king" in their title) tried to protect the peasants. Because they feared that incentives for services to the "kingdoms" -- road and bridge maintenance, court and military service, etc., would disappear and that "royal" power would be lost to the "nobility". That's, in fact, just what happened. Agrarian monarchies collapsed in the 10th century and individual fortified manors -- really castles in Italy -- became the rural power centers. Rural military families rose and military power was concentrated in their militias. The higher nobility -- counts, dukes, some of the old kings -- could maintain power only by making deals with the lower nobility and that only to the extent that they had militias of the their own. 2. Urban socio-economy Most of the ancient Roman cities survived -- although populations declined dramatically. Rome went from 1.5 million in the 2nd and 3rd centuries down to perhaps 15 thousand at the middle of the 14th century. The transfer to Constantinople, barbarian depredations, food and water supply problems, and plagues all contributed. But in the early Middle Ages and until the 10th or 11th century, Rome was still a major European population center of perhaps 50 thousand people. There was still nothing bigger in Europe, and even when the plagues of the 14th century dropped Rome's population to its lowest point, the same thing was happening elsewhere in Europe. Most of the time, Rome was Europe's biggest city. Rome also had historical and religious prestige going for it. Charlemagne, the Ottonians, the Holy Romans, everybody came to Rome to claim the "Roman" imperial crown. Papal opinions -- and especially condemnations -- counted. But some Roman cities failed, mostly up in the mountains and down by the sea. Some coastal mountain cities had existed only as (imperial/plutocratic) resorts and needed central Roman military support to survive. Crossroads cities did survive, even up in the mountains. Similarly, there were other coastal port towns, which lost their reasons for existence when imports declined whether due to lack of demand or due to loss of control of sea lanes. Urban populations no longer filled the walls of the cities. In Rome, most of the population moved off the hills and down into the Campus Martius. People huddled together in what was the lowest and still is the most pestilential section of town. Most cities maintained an urban economic identity -- town records were kept and indicated that trades and crafts persisted. As the "landed aristocracy/plutocracy" was concentrated in the cities, there was still a market for luxury goods. Trades, especially building trades, also did well as the nobles vied with each other in building urban churches and defensive towers. Some goods that were imported during the Roman Empire now were made locally in the cities. The evidence for pottery is best, but possibly only because pottery outlasts most other manufactures -- potsherds are almost indestructible. Our own "indestructibles" may include plastics and aluminum and glass beer containers, but vitreous pottery will still be right in there with the rest. Can you guess what our most durable manufacture is, according to archeologists? David McCauley's Motel of the Mysteries provides the answer -- vitreous plumbing fixtures, especially toilet bowls . Italy's classical cities were not based on commerce (although they were somewhat dependent on commerce) so the breakdown of classical commerce didn't threaten their existence (just their feasible size). 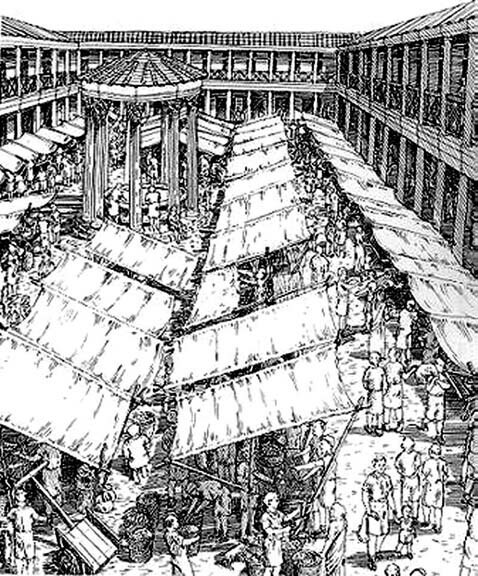 The slow revival of trade after about 750 did help cities to start to grow back to their former size. They always were and would remain later as nodes at intersections of river and road networks that, by the high Middle Ages, were again commercial trade routs. Coastal cities became trade centers and, even before the beginning of the Renaissance, they became international trade and naval powers. Venice and Genoa and to a lesser extent Pisa, were among the strongest and ultimately became masters of the reviving Mediterranean trade. Naval alliances, with major "Italian" participation ultimately swept away the Saracen pirates -- in fact replacing them and becoming looters of other peoples shorelines. Remember, the Venetians carried off (i.e., pirated) most of the wealth of sacked Constantinople and still proudly display it in and around St. Mark's cathedral. Population rose rapidly in Italian cities and the countryside as wealth and food production increased. Some population experts also attribute the population rise to the general immunity to locally circulating diseases. During the Medieval Warm Period food production had increased also leading to population increase (and at its end in the early 14th century, there were successive drought leading to famine, which resulted in malnutrition and greater susceptibility to yersina pestis plague). In the 13th century prosperity increased dramatically both in the maritime cities and in cities with cloth industry (woolen textiles) in Tuscany. Venice dominated eastward trade, especially after the 4th crusade (1204) and Genoa, eclipsing Pisa, dominated the Western Mediterranean and trade into Provence. In the second half of the 13th century, Florence gained influence in the Kingdom of Sicily due to its close ties with the Angevins and the Papacy. By the end of the 13th century, the first urban residential "Palazzos" -- small, but still Palazzos -- started to pop up in Italian cities. There was also enough excess wealth to build new municipal buildings, like Rome's Palazzo Senatorio, built over the top of the ancient Tabularium. Big new churches were built in the cities, especially for the Franciscans and Dominicans; Assisi became Italy's biggest religious tourist attraction. The Tabularium/Palazzo Senatorio building played a part in many Roman developments. The Tabularium had been built as the national archives of ancient Rome over an archaic temple of Veiovis (later identified with, but not identical with Jove). In the Middle ages it was first fortified as a residential compound by the Corsi family. When the Roman Free Commune was established in 1143 the Corsi "Palace" became the seat of the Senators and local magistracy. By 1299 it had been aggrandized by the addition of a loggia by Pope Boniface VIII. Petrarch was crowned as Rome's first Poet Laureate since the end of the Empire in the council chamber in 1341. In 1354, on the steps leading up to the loggia, Petrarch's protégé, Cola di Rienzo, was torn to pieces by the mob that had formerly supported him (more on them in later units). Some historians list Petrach's laureateship and/or Cola's death as ending the Roman middle ages and starting the Renaissance. As mentioned above, there were agricultural and health crises in the 14th century, but even then, despite these setbacks, northern and central Italian trade, manufacture and venture capitalism recovered rapidly -- in fact, population when declined (after the rapid gains of the two previous centuries), that left resources to be shared out among fewer people. Individual artisans, tradesmen, even urban laborers and rural peasants got richer after the plague because they more easily and more dearly could sell their products and labor in a shortage economy. In the central and northern countryside, sharecropping gradually replaced tenancy, but there were also more freeholders in the later years. New rural technologies and methods were also developed in response to population growth, and an upward spiral began -- population that had been limited by agricultural production and lack of food imports now was the engine behind more production and renewed imports. A new "heavy" plow pulled by teams of oxen allowed deeper plowing, which brought nutrients to the surface. "Intensive farming" meant more crops growing on fewer fields, which should have allowed crop-rotation and more fallow fields. But population again outstripped production and the fallow fields more and more marginal lands were all forced into production. (This was, in fact, the pattern in most of temperate Europe at this time.) This was all OK until agricultural conditions changed. The Medieval Warm Period and the Little Ice Age: Yes, Mother Nature took a hand. The increases in agricultural production in the 12th and 13th centuries were partially caused by what is now known as the "long term pattern" of the North Atlantic Oscillation -- we are more familiar with its Pacific analog which is associated with El Nino fluctuations. What it boils down to is that it was warmer than usual in the 12th and 13th centuries and that also meant much more moisture for Europe as warm air flowed inland from the Atlantic. But some trip point was reached in the second quarter of the 14th century and the pattern reversed: cooler drier air covered Europe and what is now known as the Little Ice Age ensued. Meteorologists say that it lasted until about 1900. What we are experiencing now -- what the ecologists call Global Warming -- is an upward swing toward "normalcy." This all appears to be driven by long term Solar cycles. Note that the direst predictions of the ecology industry are probably true -- it's only when they put too much emphasis on the effects of human activity that they go off track. [Coastal flooding is a good example of real "Global Warming" effects. The Netherlands were under water through most of the Medieval Warm Period as were large areas around the Chesapeake Basin -- the latter, by the way, formed by the arrival of a mile-wide rock from space called the Chesapeake Bolide about 35 million years ago]. We could do another whole course on the long term Solar cycles, the Atlantic and Pacific oscillations, the Japan Current and the Gulf Stream, sea and land tides, etc. -- maybe some day. As a result of the plague, reduced population meant less food was needed so fields could lie fallow more often. After the population reductions caused by recurring plague outbreaks, the rural peasantry could no longer be held in their "home" estates -- they had bargaining power because they could simply decamp and sell their labor to another estate or move into town where labor was also scarce. Smaller rural populations also meant that some landowners, including the papacy were forced to lease their land to farmers at low rates and for long terms if they wanted any income at all for their lands. In a later unit, we'll talk more about the opportunities that arose as a consequence of the agricultural collapse caused by climate change, over-stressing the land during the Medieval Warm Period, and plague induced population reductions.